I know this is off-topic but since you mention it what does Entity Framework has to do with all this? Every database should try to generate the optimal plan for the intended result set no matter if the SQL is hand-written or generated. On your latter sentence: the reality is that not every database succeeds at this (and then there’s various degrees of success within different RDBMS’). 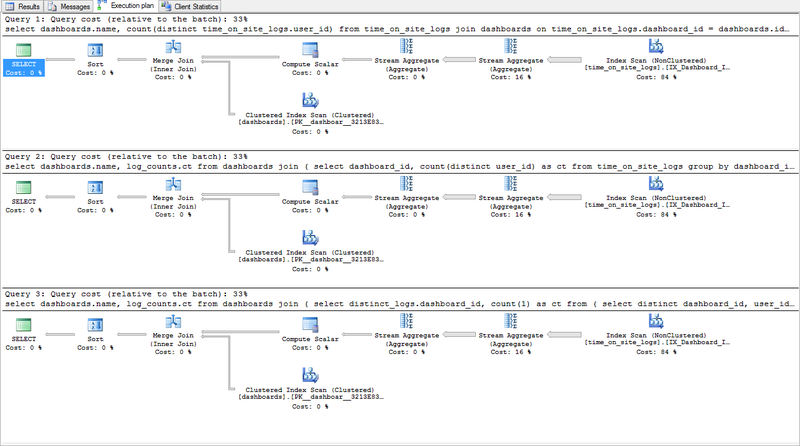 Over at Periscope’s blog you see how PgSQL generates different plans for different-but-equivalent queries. EF 5 and 6 have pretty good query generation, but there are still improvements to be made to make the generated queries as simple as they can be. 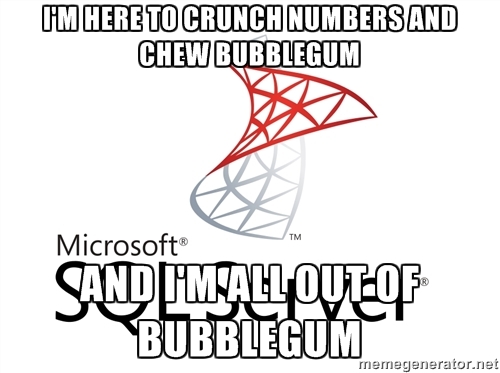 So with MSSQL it’s good that it can cut through indirection and go straight for the best plan. Also, with an ORM you’re usually at arm’s length from the database so your ability to work around badly generated queries becomes more limited. The more frequently your database generates “the best” plan for a verbose, generated query means less work for you. One concern with the periscope results (and many others) is that they don’t provide “ping” style results [(set size) / (best) (average) (worst)]. In fact they throw away the first result which in production may frequently be the ONLY result significant to the user experience. In this case postgresql might have sucked every time where the others completely cached the data for subsequent runs… but maybe that was simply a result of postgresql’s cache not being configured properly. Of course it’s possible that having this data would make postgresql look even worse, and that bad caching would have only aggravated some bad query optimization, but we’ll probably never know.